Almeida Garrett Library, in Portuguese Biblioteca Almeida Garrett, is a library in Porto, Portugal. It is located at 328 Rua Entrequintas on the gardens of Palácio de Cristal. The library was inaugurated on 2001 and it is named after the writer Almeida Garrett (1799–1854) who was born in Porto. Taylor’s Port wine cellars in the heart of the historic area of Vila Nova de Gaia, across the river from the old city centre of Oporto, house most of the company’s extensive reserves of wood aged Port as well its Vintage Port cellars. The cellars are long cool, dark warehouses, their thick granite walls and high ceilings helping to keep out the heat and maintain an even temperature throughout the year. This ensures that the wines age slowly, gradually acquiring the sublime complex flavours and aromas of maturity. Wines in the cellars age either in cask or in vat. Casks are seasoned oak barrels usually holding around 630 litres of wine. They are used mainly to age Tawny Ports, in particular the smooth and mellow 10, 20, 30 and 40 Year Old Tawnies of which Taylor is the leading producer. Cask ageing encourages contact between the wine and the wood and intensifies the ageing process. The rich and complex aromas of maturity, such as notes of butterscotch, walnut and fine oak wood, therefore develop more quickly in a cask. Oak vats normally hold at least 20,000 litres of wine. In these impressive vessels, there is less contact between the Port and the wood. This method of ageing is therefore used mainly for the fruitier styles of Port where the wood ageing is intended to give the wine smoothness and a degree of complexity but allow it to retain its youthful structure and freshness. Wines such as Taylor’s First Estate Reserve or LBV are both aged in vat. The thousands of wooden vessels lying in the Taylor Port cellars are maintained by a team of specialist coopers whose job it is to look after and repair the casks and vats and make new ones if necessary. 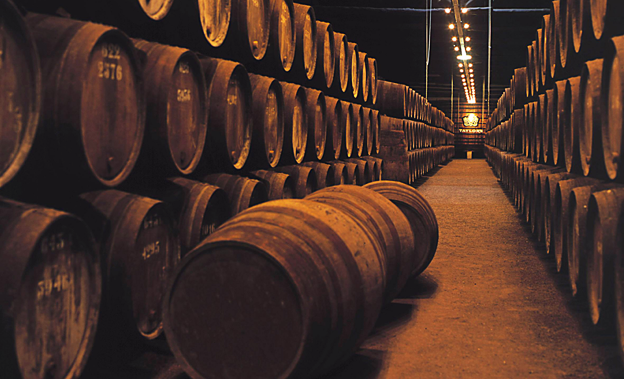 While Port matures in wood, a small proportion is lost each year to evaporation. The part which evaporates – commonly known as the ‘angel’s share’ – is composed of moisture and spirit. As a result, the aromatic components which remain in the wine gradually become more concentrated as it ages. This accounts in part for the very rich and concentrated flavours which can be found in the older Tawny Ports. The evaporation of the spirit causes the development of the black ’Angel’s share fungus’, Baudoinia compniacensis, on the roof tiles of the lodges, making it easy to see from the air where the wine is stored. Below the cellars, are the tunnels which house the Vintage Port cellars. Here the Vintage Ports age in bottle, lying horizontally to keep the corks moist. When the time comes to ship them, the bottles are removed from the cellar to be labelled and placed in wooden cases. Taylor’s Port cellars in Vila Nova can be visited throughout the year. The visit can be made even more enjoyable by a lunch in the Barão Fladgate restaurant next to the lodges or a stay at The Yeatman, the luxurious 5 star hotel located a few steps away just across the road. In former times nearly all the Port was brought down the river from the Douro Valley to the lodges in Vila Nova de Gaia in the spring following the harvest. This was to avoid exposing the wine to the dry summer heat of the Douro which would cause the wine to age too quickly and develop the roasted flavours known as ‘Douro bake’. Nowadays, with modern building insulation and air moisturising techniques, it is possible to replicate the cool, damp conditions of Vila Nova de Gaia in the Douro. This has been successfully achieved in the modern ageing lodges at Quinta da Nogueira where some Taylor Ports are now aged. These insulated warehouses are located on the windy uplands close to the town of São João da Pesqueira and the environment is kept cool and moist by spraying tiny particles of water into the air through jets fitted to the interior walls of the buildings.